There are two different kinds of wikiendis in the year – regular wikiendis, and Wikiendi LIVE wikiendis. March 24th will mark the first Wikiendi LIVE wikiendi of 2018, and word on Eyasi street is that it’s going to be BIG. 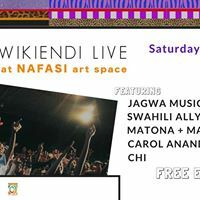 Jagwa Music --- the leading exponent of the Mchiriku style, which originated twenty years ago in the poor suburbs of Dar es Salaam ft. casio keyboards, vintage amps, and megaphone, resulting in gritty, edgy,distortion-laden sound. This new style now thrives in Tanzania, although it's been deliberately ignored by the media, as it is associated with uhuni (thuggery) and the city’s low life. Swahili Ally: DIGO --- a talented musician from Tanga who fuses his vibrant performance of digo music with the dazzling sound of the kora. He uses the West African instrument to pronounce his digo heritage in a unique style. His powerful message, delivered though his strong and enchanting voice, delivers a memorable and exciting performance. Matona + Man Sulei --- icons of ‘Swahili Jazz’, an original and unique arrangement of traditional music styles, which includes Swahili songs, Arabic forms, oriental tunes and jazz. 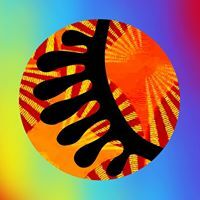 The African component celebrates the traditional music of Tanzania, the music of the Comoro Islands, Mayotte, La Reunion, Madagascar and Ethiopia. Chi --- Tanzanian by way of Senegal, Chi is a nomadic songstress who makes music as diverse as her upbringing. A self-titled“Neo-Soul Revolutionary,” Chi seamlessly blends her lyrical styling with soul, R&B, old-school blues and rock, fearlessly expressing her equally multi-faceted soul. Caroline Anande Uliwa a.k.a Carol Anande --- a poet, singer & budding percussionist from Dar es Salaam, Tanzania who creates diverse work that is unique and packs serious grit - albeit raw in its presentation. 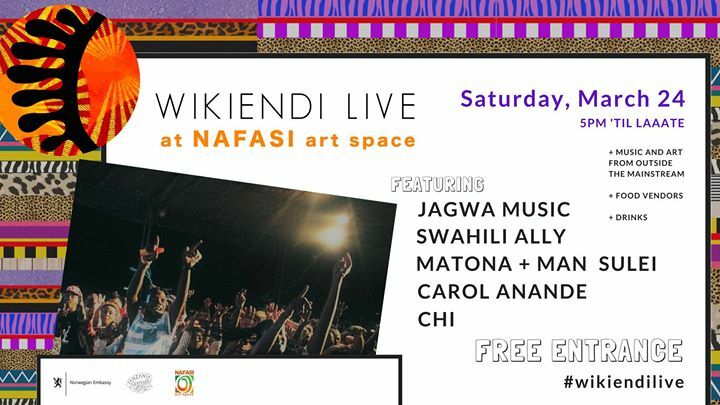 + a special early DJ session ft. John Kitime and his impressive Tanzanian vinyl collection?, a live graffiti showcase ?, a stunning dance performance by T-Africa ??? ?, and an exhibition by our current Artist in Residence, Marius Comanns (Germany)?‍?. + the event will be preceded by this month’s ChapChap Photomontage: Public Art Workshop from 3pm!! MDA// Saa 11 jioni mpaka MAJOGOOO! Chi --- Mtanzania kwa njia ya Senegal, Chi ni muimbaji msafiri anayounda miziki ilio navionjo vya kote alikopita. Anitaja kuwa“Mpinduzi wa Miziki wa Soul” kwa namana anachanganya mashairi ya pekee na midundo ya soul, R&B, bluzi na rock kuzleta hisia zote za roho bila haya. Caroline Anande Uliwa a.k.a Carol Anande --- Ni mshairi, mwimbaji na mcheza ngoma chipukizi toka Dar anayounda kazi zisio na kificho—msanii anayoacha yote pale jukwaani. Jagwa --- waogonzi wa mziki wa Mchiriku, ambayo ulitoka miaka ishirini iliopita katika mitaa ya hali ya chini Dar es Salaam na inayo fahamika kwa utimizi wa keyboard, vipaza sauti na amp za zamani kwa uundaji wa nyimbo za uhalisi kabisa. Nyimbo ambazo zinavuma Tanzania hata bila msaada wa media ambazo siku zote zachukuliya utamaduni huu vibaya. Swahili Ally --- mwanamiziki hodari wa Tanga anayo changanyisha nyimbo za kidigo na chombo cha kora toka Arfika magaribi. Anatumia hichi chombo kuenzi ukoo wake wa digo kwa namna mpya. Anaujumbe mzito, unayo letwa na sauti nyrororo, kufanya tukio lakusisimua na lisiosahaulika. + na kabla yote kutakiwa na workshop ya Chap Chap saa 9 kamili jioni ambapo watu watajifunza namna yakutengenza picha za montage!